Hu was born in 1967 in the city of Shen Tan in Hunan province. After finished his secondary school at the age of 18, Hu worked in a local electrical factory. It was in 1989, Hu was admitted by Hubei Art Academy and specialized in oil painting. 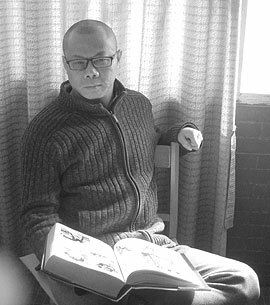 After graduated from the art academy in 1993, Hu took up a few jobs, including as an interior designer, editor for a local art magazine and advertising director, etc. Apart from oil painting and art creation, Hu lectures art at universities and art schools in Wuhan. Hu’s work of art presents a sense of liberalism, openness and individualism which carries characteristics of trendy, spiritual and traditional. There is no limit to the themes of Hu’s artwork.